What’s for dinner tonight foodies? Today I am sharing one of my favourite week night supper recipes. 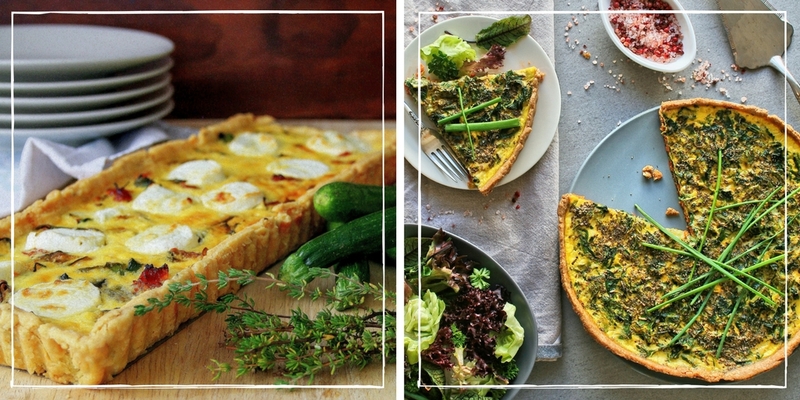 It is a delicious and easy quiche recipe that can be adapted to include any of your favourite fillings. If I have a few spare minutes during the day I sometimes prepare the crust or filling in advance and simply add the egg and milk mixture just before baking, but it is quick enough to put together in the evening making it a brilliant weekday option. 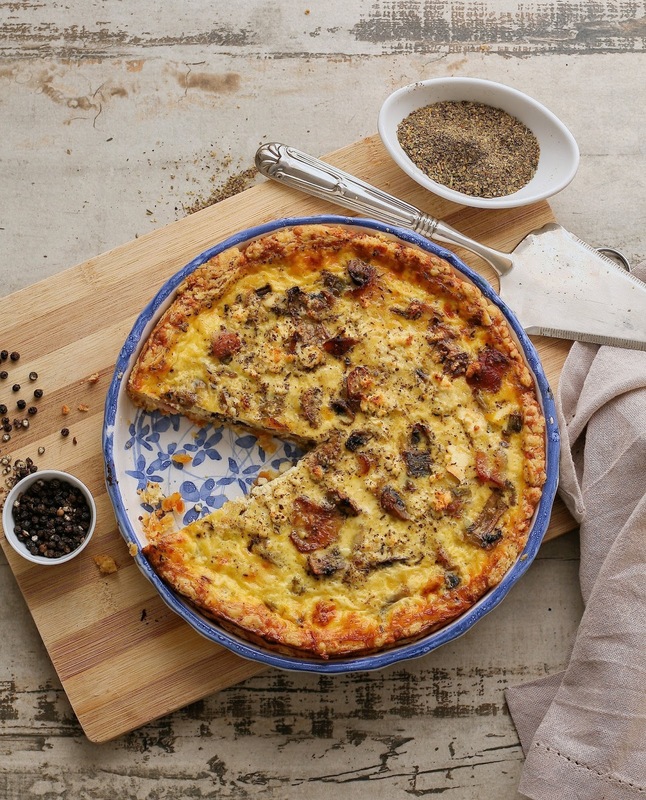 Can we just talk about this quiche crust for a minute because it is unquestionably My.Absolute.Favourite. 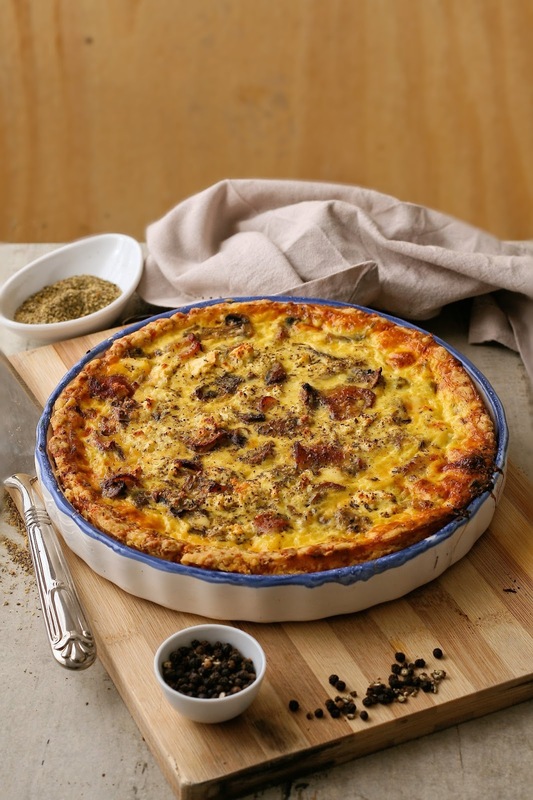 I have played around with many different quiche bases over the years, even venturing into the gluten free and low carb options, but in terms of flavour and texture I have never made a crust that beats this one. The sticky-ish dough transforms into a cheesy, crumbly crust of deliciousness that tastes brilliant with any filling. It also doesn’t need to be blind baked which is rather convenient. 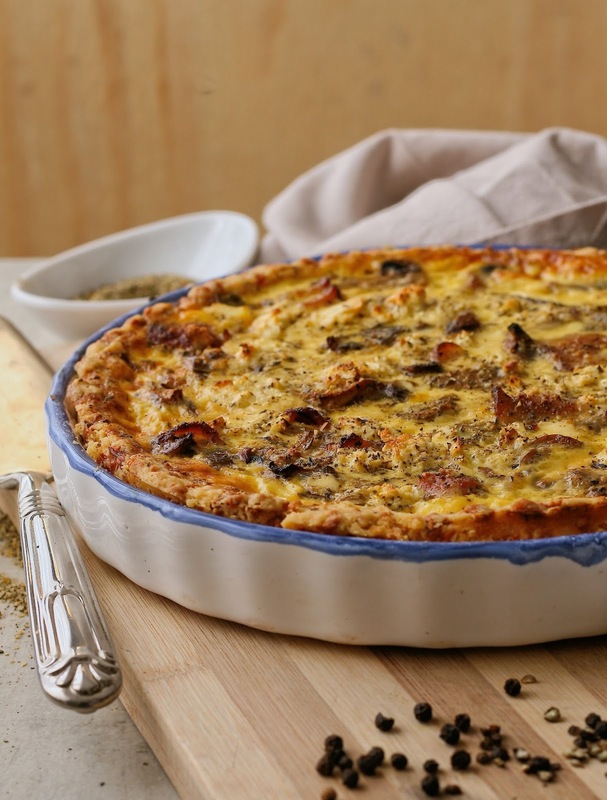 There is of course no end to the number of filling variations you could make with this quiche. Got a spare baby marrow or two rattling around in your veggie draw? A lonely spring onion or a forgotten yellow pepper? Throw them in! 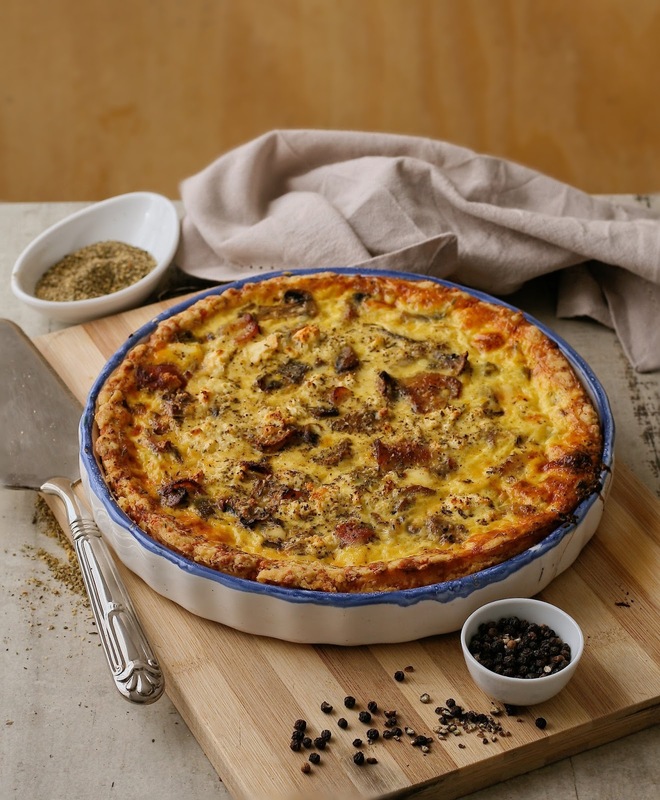 Bacon and mushroom quiche is always a hit with my family but our other favourite variations are spinach and feta, mixed roasted vegetables and butternut – the filling is usually dependant on what is in my fridge at the time! The base can be prepared in advance and kept in the fridge for a few hours. It can also be frozen. Use any filling that you like and simply add the same egg/milk amounts as below. For a richer filling replace half or all of the milk with cream. 1.) Heat a drizzle of olive oil in a frying pan. Add the garlic, leek and mushrooms. Stir over a medium heat for 5 minutes to soften the leeks and mushrooms. 2.) Add the bacon to the pan. Cook for a further 5 minutes. Remove the pan from the heat and set aside to cool. 3.) Preheat your oven to 190°C and grease a 20cm pie dish. 4.) Prepare the crust: place the butter and flour in a mixing bowl. Use your fingertips to rub the butter and flour together until the mixture resembles large breadcrumbs. Add the cheddar cheese and continue to rub together until the mixture comes together into a ball of dough. 5.) Place the dough in the greased pie dish. Gently press the dough out evenly over the base and up the sides of the dish. 6.) Tip the mushroom mixture into the crust and spread out evenly. Crumble feta over the top. Whisk the eggs, milk and a grinding of black pepper in a small bowl and pour over the filling. Sprinkle mixed herbs over the top. 7.) Bake the quiche for 40 minutes or until cooked through. Allow to cool slightly before serving. Awesomeness, fabulous! I had the 'Snowflake Recipe Book' many years ago – it included cheese in the crust and as described is totally scrumptious! Thank you for reminding me what we've been missing out on! Thanks Vanessa, the cheese crust is a definitely a winner!